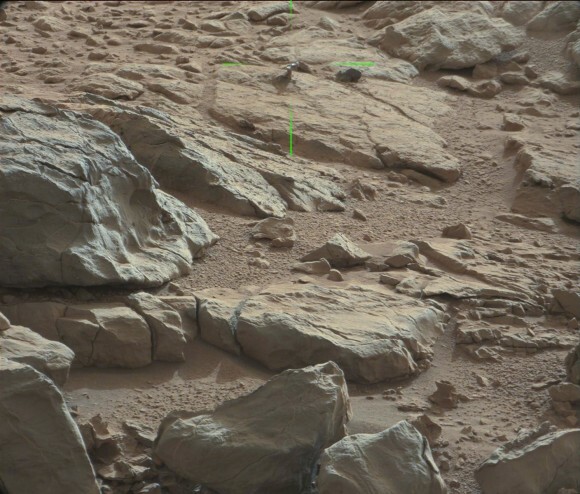 Green lines point to a shiny protuberance on rock imaged by the Curiosity rover on Mars. Credit: NASA/JPL/CaltechMalin Space Science Systems. Image processing 2di7 & titanio44 on Flickr. A closeup of the shiny protuberance. Credit: NASA/JPL/Caltech/Malin Space Science Systems. Image editing by 2di7 & titanio44 on Flickr. The Curiosity Mars rover has found some strange-looking little things on Mars – you’ve likely heard of the Mars ‘flower,’ the piece of benign plastic from the rover itself, and other bright flecks of granules in the Martian soil. 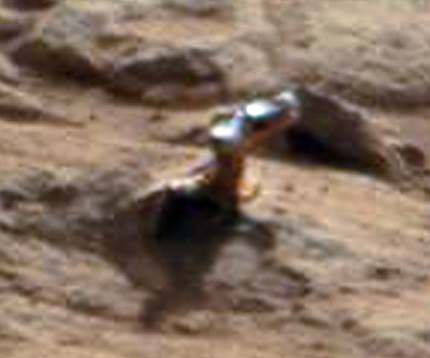 Now the rover has imaged a small metallic-looking protuberance on a rock. Visible in the image above (the green lines point to it), the protuberance appears to have a high albedo and even projects a shadow on the rock below. The image was taken with the right Mastcam on Curiosity on Sol 173 — January 30, 2013 here on Earth — (see the original raw image here), and was pointed out to us by Elisabetta Bonora, an image editing enthusiast from Italy. Read more: Another Weird Shiny Thing on Mars — Universe Today.